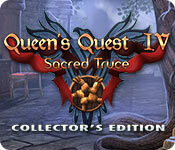 Brave Giant proudly presents Queen's Quest IV: Sacred Truce! An ancient truce is broken when an assassin attacks the Elven king! Peace hangs by a thread as hatred and chaos begin to swallow the five races of the realm. Now a hero must stand tall and remind the races of the vows their ancestors pledged long ago. Maximus Pax is that hero. As a member of the Peacekeeper's guild, he's the only one with the power and authority to stop the world from falling into decay and destruction! His weapon is neither a sword nor bow but the power of the Sacred Truce! In order to save the realm, he must solve an ancient mystery. Will Maximus expose the villain in time and restore peace to the realm? 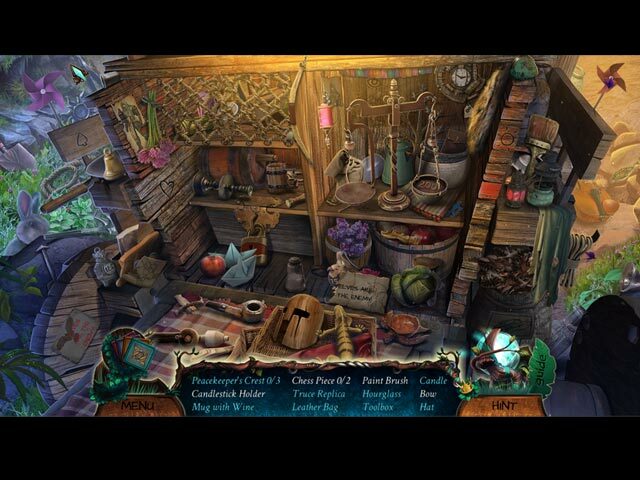 Find out in this epic hidden-object puzzle adventure game! Queen's Quest IV: Sacred Truce Collector's Edition is rated 3.9 out of 5 by 21. Rated 5 out of 5 by Lisistrata86 from Epic adventure! I really like fantasy games with all the fantasy races and characters! This one is just right for my taste. Graphics are well done, story is intriguing , voices are good, could be better. I can play this one with my children! Rated 4 out of 5 by Majestyx12 from Glad I stayed with it Based on the trial I wanted to delete when they had us climb, I didn't want to do that and I was so bored but to be fair I stayed with it because I found some good games if you can get over the hump sometimes. The more I stayed with it the more I wanted to stay. Now I want the game. I like fantasy games with Elves, Goblin etc. It got interesting toward the end of the trial and I liked the hops toward the end and I liked him helping the helpless. Rated 4 out of 5 by FunwithBigFish from Good rainy day game I first demo'd the game and found the storyline engaging enough for me to purchase on sale. It is beautifully drawn, there are a variety of activities to do, including several fun flights.The HOs have multiple morphing items and have actual hidden objects. I haven't completed the game; I'm in the second chapter and that took about 3 casual hours so I expect another 3 hrs out of it. It's not a cookie cutter game like so many right now. Rated 3 out of 5 by LunaNik from Nothing new. Slow-moving plot. Easy gameplay. The second episode in this series, Stories of Forgotten Past, was the only one to show innovative gameplay and an engaging storyline. In this episode, the plot…well…plodded, bogged down by the standard laundry list of tasks. The HO scenes weren't bad. Mini-games are few and far between…and too easy. Exploration involved mostly playing Mr. Fix-it with broken everything. The production is quite beautiful, except for blurry cutscene animation, but I couldn't become engaged in this one. I recommend you play the second episode instead. Rated 2 out of 5 by Yurnmesis from Trial: Healing Potions! Runes! Oh, My! Nothing new. Graphics are good. Abundant Mini Games. 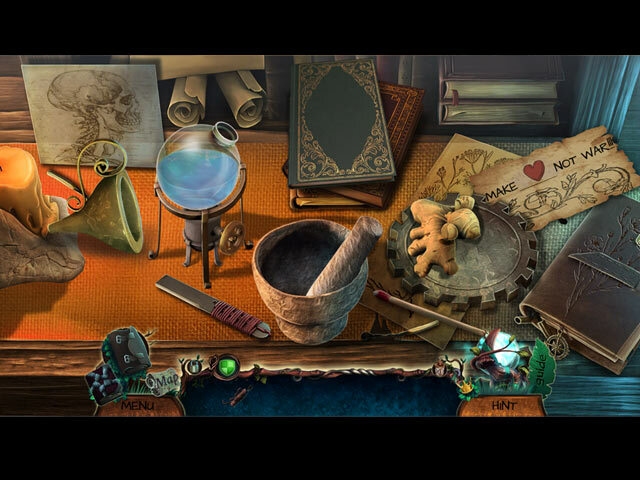 Annoying picture story-book Hidden Object Games. 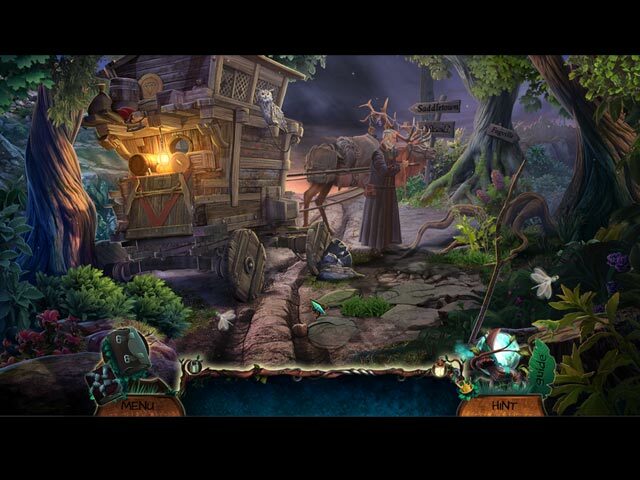 Also, regular word list Hidden Object Game that offers a quantity of objects and good visibility. Both HOG and Mini Games are well designed but nothing exciting. Characters are okay and nicely crafted but not much action or animation. Fun looking critters and a variety of scenery. Like many said…been here before. I really don't want to face another healing potion journey of finding multiple items to make potions, so over utilized and lazy development. Sadly many games are just change ups of over used old game themes which are a big "slap in the face" to players who have asked for more innovation and new direction in these games. Some might like this game to kill time, but that isn't why I play. I suggest you give it a trial run to form your own opinion. Rated 2 out of 5 by Granny_Gruff from I'll Throw You a Ham For Your Crutch! In the fourth installment in the Queen's Quest game series, there is no queen, at least in the Demo. There is a wounded Elven King and a vendetta against the humans the elves blame for the attack on their king. You will play as the Peacekeeper assigned to stop the war that is breaking out. After being knocked off your horse on the road, you ride into town in time to free the mayor from the beams blocking his door. He collapses outside and you revive him in time for him to be kidnapped by an elf on a giant eagle. Good stuff: You will have your magic book to keep the rune parts you find and the required special colored liquid to pour on the completed rune for each spell. A variety of mini-games and puzzles, HOPs and the whisp of a story are provided along with collectible eggs and coins and assorted CE bling. There is a card game alternative to the HOPs. Bad stuff: Unfortunately this game suffers from the same logic and procedural problems in the earlier games. So you will be hunting for carrots to feed the elf the mayor rides as well as its saddle. Then you ride after the captured mayor on his elk with the antelope horns. (Why antelope horns?) The mayor had sent you to find a copy of the treaty in his secret room. This is the entire second floor of his house. How secret can an entire floor be? From whom? You make it to the Elves' Sacred Tree and work your way up toward the throne room. You go through the prison, where an elderly man in a cage asks for help. You fetch him water and a ham, laying on a shelf nearby. He gives you his crutch. (!?) The first collectible egg looks like a tall artichoke, the next like a very large rose colored Easter egg, and the third I clicked on accidentally. The coins are the size of dinner plates and have a rune in the center. I would have like even a little challenge in finding them. Bottom line: Once again the game play leaves me confused and the bare bones story leaves me unaffected. There just does not seem to be any one of the developers trying to make these games better and more cohesive. Please try the demo and see what you think. Rated 1 out of 5 by pgillenw from Difficult for Me to Rate a Game so Low! I say I have reached my limit of games offered such as this one. The story is suitable for kids yet the play might be a challenge for the younger ones. I am just fed up with the fantasy games. I am a older adult who appreciates games such as 13th Skull and the original Dire Grove. I want substance in my games. Time creators to evaluate exactly who are the purchasers of the games you develop. Bigfish might consider categorizing games for mindless youth. Rated 1 out of 5 by MissAbby from Forget a Sacred Truce..Just Surrender This game was like most of the other game offerings these days. Same old cookie cutter story, games, puzzles etc. The graphics were sharp and a bit grainy. The HOPS were easy but hard to see. The puzzles were nothing new and the gameplay was "pick up put somewhere else". I will not buy this game. The fate of the realm depends on your ability to reunite the five races and remind them of their vows!